Wasps director of rugby Dai Young says his side are still searching for a "killer instinct" this season, despite thrashing Premiership leaders Saracens. Wasps ran in eight tries as they hammered the defending champions 64-23 to move up to fourth in the table. "When we're playing a team we know will make us pay if we don't get things right, we respond to that," Young said. "Against teams we probably should beat, we don't have that cutting edge - we have some development to do on that." The win over Sarries was the latest impressive result for Wasps, who have also beaten Northampton Saints and won their pool to qualify for the quarter-finals of this season's European Champions Cup after victories over Leinster and defending champions Toulon. But it is their narrow wins against the struggling sides that is keeping Young level-headed. 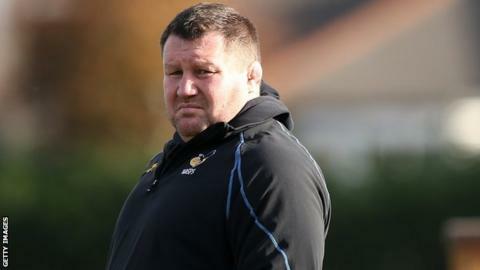 "We're still fighting for that consistency and killer instinct," he told BBC Coventry and Warwickshire. "It frustrates you when, against the two bottom teams in the league we've got out of jail - we probably should've lost against Worcester and Newcastle at home." Despite moving into the play-off places, Young refuses to get carried away with their rise. "It's the wrong time of year to be in there - if it was the last week of the season, I'd be thrilled," he said. "The reality is we're halfway through the season and there's a long way to go. The league is ridiculously tight. "It would be a big mistake to talk about the top four. Come the last few weeks of the season, if you're in the top six then you can think about it.